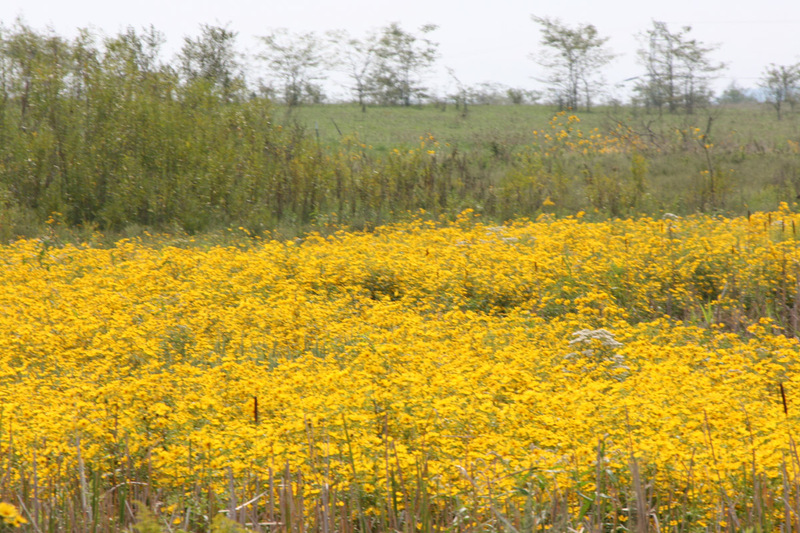 I did not think I was going to get to see the seas of yellow this fall...but with the return of rain, the flowers popped up in the usual spots out at the strip pit. 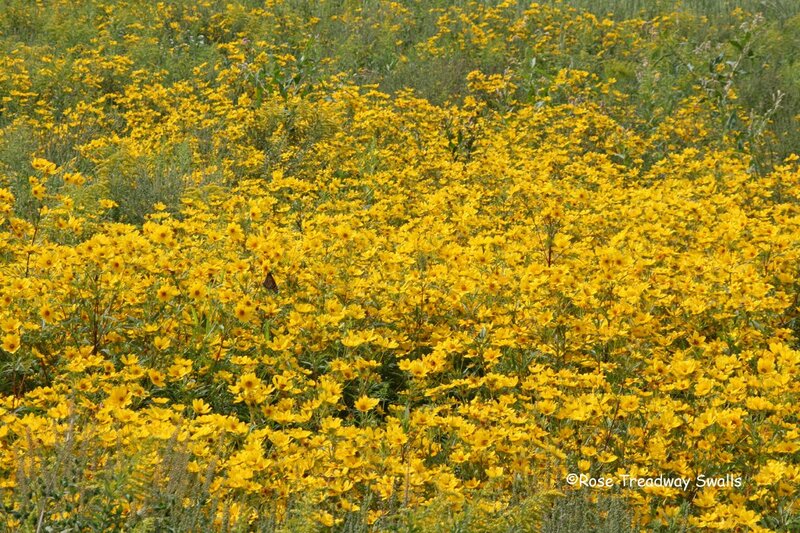 Oh, I so love to see the patches of bright yellow here and there. They are alive with bees and butterflies and insects. Notice the background in the shot below...see the green!!! Look back at this post.....that hill is the same hill in the background, just a hundred yards or so on north. The other side of the road is this weedy field...I happened to glance over and this is what I saw. Can you believe the rack on that thing...he was quite a ways away. 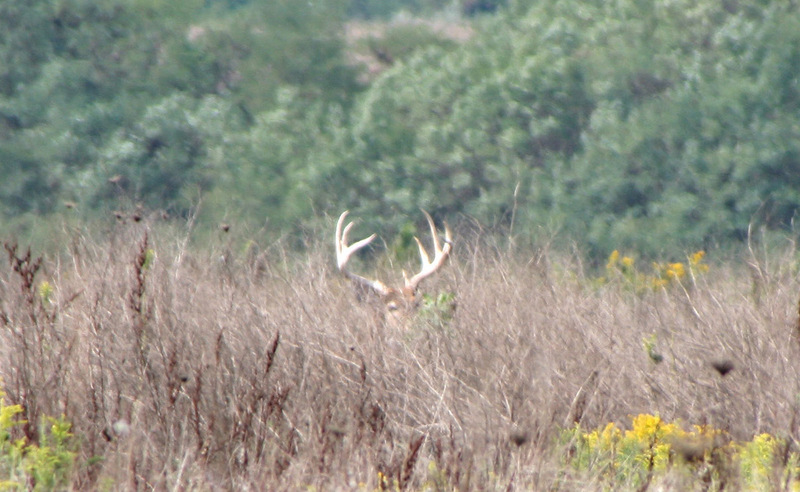 I had my lens out to 300mm...so I am thinking he was at least a 150 yards away...maybe more. I am not a judge of distance. Here I cropped one of the photos till you can see the mass of the antlers. That is one big boy! We messed around yesterday...we ended up driving through the strip pits and coming home. Then later in the evening, we headed to Mansfield...to try fishing. First we fished in the tailwaters of the main dam. Roger caught a couple, and I caught zero...not one single thing. Then we headed to fish below the mill at Mansfield. I caught two....but that was it. Water is so low there. We have had a little rain this morn...everything looks fresh and green. I am not sure what we are doing today. Maybe nothing. Which sounds good to me. Wow, that is a bug guy! I hope he can hide those antlers from hunters! The 'rash' or whatever it is got better last night, cuz I showered immediately after work & didn't reapply my deodorant, so I'm guessing it had a chance to dry up... I haven't even had to hit the Benedryl bottle today, I only applied some Aloe Vera after another shower this morning... so far, so good, but someone suggested getting some Gold Bond cream, so I'll try that after work today. What all did Roger use to help w/ the itching when he broke out? I had been alternating between Calamine lotion & Aloe Vera, but the Calamine lotion they make these days is nothing but a runny mess... it used to be thick where you could actually spread it over the affected area... I just don't like the stuff, now. That is a huge rack on him. Jim hasn't been fishing lately trying to get the sauna done. Did you enjoy a fish dinner? or Did you catch n release? Nice post! 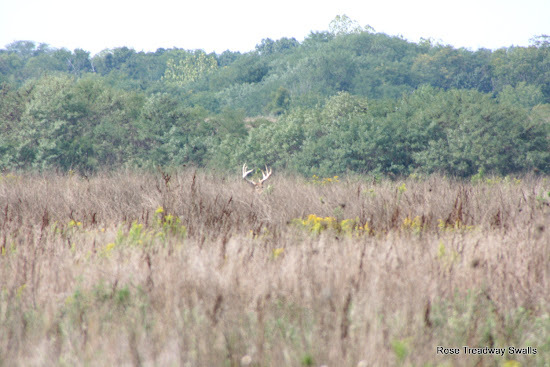 Love the deer antlers sticking up out of the weeds. Nice work! Lovely yellow flowers, and what a surprise to see that big buck! Bet you were doing a little happy dance. Wow..that is a big rack for sure. Makes it hard for him to hide :-) I like the one eye peering at you. Great flowers...so glorious and yellow! I love how just the antlers and a little of the head can be seen! Fun photo, Rose!